'Dancing With the Stars': Normani Dazzles; Who Went Home? On Monday, April 17, Dancing With the Stars took viewers to the happiest place on Earth — the ballroom! Yes, it was Disney night, a staple from the ABC competition series that happens every season and requires the couples to bring famous songs and characters from popular movies to life. While some are easier to adapt than others, the performances were generally strong across the board. Watch all the highlights in our video recap above! Early on, it was announced that Erika Jayne and Gleb Savchenko, Nick Viall and Peta Murgatroyd, and Normani Kordei and Val Chmerkovskiy were the three couples in jeopardy, but one of those pairings came back to deliver the highest-scored dance of the night. Shortly after finding out they were, in fact, in danger of going home this evening, Fifth Harmony’s Normani and partner Val delivered a paso doble to Donny Osmond‘s ballad from Mulan that wowed the judges. Julianne Hough went wild for its “girl power” message, but all four of them found it very impressive and rewarded the pop star with three perfect 10s and a 9, for 39 in total. Hot on her heels was Simone Biles, however. The athlete’s contemporary routine with partner Sasha Farber to Moana landed just one point shy of Normani’s, at 38. In her video package, Simone got frustrated with Sasha, who was pushing her quite hard, and she even said that she’s scared of how intense he is. It’s hard to believe he’s more intense than the U.S. Olympic gymnastics coaches … but … whatever. Their routine was fabulous, and she is definitely a contender for the top prize. Poor David Ross and Lindsay Arnold. They are trying so hard, and they both have great attitudes, but he just cannot keep up with the rest of the pack. This week, they were tasked with a jive set to a song from Cars 3 (which isn’t even out yet). Bruno Tonioli kindly said it was an especially hard style, but praised Ross’ fighting spirit. Everyone clearly appreciated the baseball player’s personality and drive, but all agreed he was flat-footed (at best), and his score landed at 29, the lowest of the night. Bonner Bolton and Sharna Burgess also struggled this evening, though. They performed a tango to Wreck-It Ralph that the judges praised, but it scored low anyway. Len Goodman loved that it had loads of content, and Julianne said Bonner really pulled off the character. Bruno, however, saw a few “cracks” in the execution, and the bull rider ended up only one point above Ross, at 30. 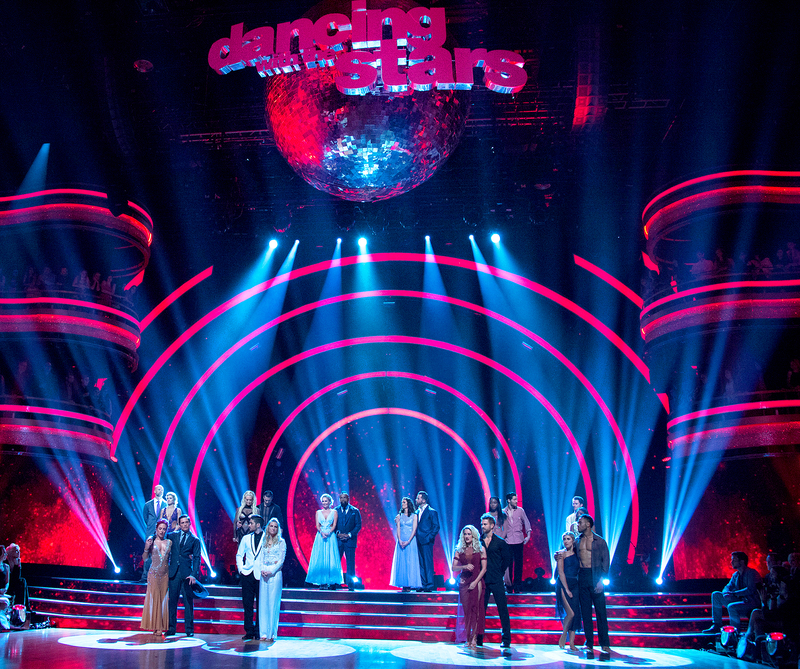 The rest of the couples landed in the middle with routines that got them through but didn’t make much impact overall. Nancy Kerrigan and Artem Chigvintsev performed a jazz number to Enchanted that earned them a 36. Nick Viall and Peta Murgatroyd teamed up for a jazz routine to Pinocchio (which was beyond weird but the judges seemed to like) that got a 34. Heather Morris danced with Alan Bersten again (though Maks Chmerkovskiy is supposed to be back next week), performing a jazz dance to Frozen that got mixed responses from the judges but tied them with Nick and Peta at 34. Rashad Jennings and Emma Slater fell a lot in terms of score this week, dropping from a 39 last week to a 32 for their Beauty and the Beast–themed foxtrot. Carrie Ann Inaba thought the NFL player was too restricted in his movements and gave him a 7, which really brought down his total. Erika and Gleb had to dance immediately after finding out they were in jeopardy. Their Viennese waltz, with its Finding Dory theme, struck a chord with the judges, but that didn’t matter since their fate was sealed. At the end of the night, the Real Housewives of Beverly Hills star was sent home. “I did have a breakthrough,” Erika said. “I had a wonderful time. Thank you all so much. It was an incredible experience.” When Tom Bergeron called her out for whispering to Gleb, “I told you,” after their names were announced, she denied it. Maybe it was a case of Housewives amnesia that seems to be going around these days. Tell Us: Do you think the right couple went home?